Thank you Jackie and drinkgal.com! When most people think of cachaça, they think of Caipirinhas and very little else. As a bartender, for years we would have the same lonely bottle of cachaça sitting on the shelf for months, and when a patron would ask “what do you use that for?” I would pull it down and mix up a Caipirinha, explaining its fame (the national alcoholic drink of Brazil) and that cachaça is a cousin of rum, made from sugar cane instead of molasses. Most cachaça has a smoky, gasoline-like quality that would be considered charming to some in a caipirinha, but one would be hard pressed to find another drink where the spirit would add anything that a good rum couldn’t do better. For the life of me I didn’t have another recipe to offer anyone interested in the Brazilian rum cousin. 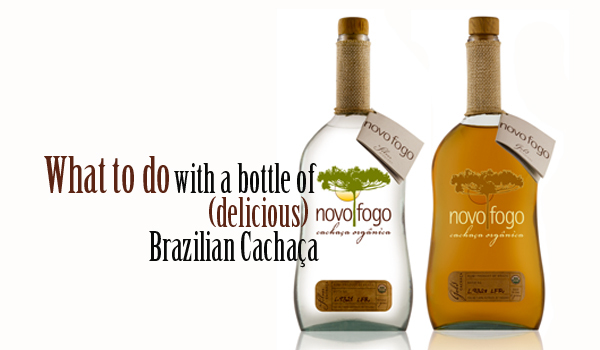 Enter Novo Fogo, a line of USDA certified organic, cachaça from Morretes, Brazil, now available stateside to thirsty American imbibers. Distilled in gorgeous setting on the edge of an idyllic rainforest in a zero waste distillery, and bottled in handmade bottles made of recycled glass, it has already put itself in a different class than most of its cohorts. LUPEC Seattle (Ladies United in the Preservation of the Endangered Cocktail) teamed up with Novo Fogo for our December meeting, making this tasting possible. We got a chance to catch up with Dragos Axinte, one of the owners of the brand (the other is his lovely wife Emily), to learn why Novo Fogo is a cachaça of another breed. First of all, both were very smooth. Part of this, Dragos explains, is because Novo Fogo cuts instead of burns when they harvest the cane. Also missing? That gasoline flavor we were talking about earlier. The distillery is at the edge of the Floresta Atlântica rainforest (the other Brazilian rainforest, it seems), there is only one road in, and it is nowhere near the fields of cane. The Silver ($28) is as you would expect, clear. It’s ‘rested’ for a year in stainless steel, so It is floral on the nose, with hints of banana and lime. It doesn’t linger on your palate, with a citrusy and slightly salty taste, caused by the sea breeze that moves up the mountain from the coast. It is, by far, the most pleasant of any cachaça we have ever tried, and while we didn’t try it in a caipirinha, we imagine it to be a lovely experience indeed. The Aged ($35) is er, aged, in re-purposed bourbon casks for two years. Re-purposed is different than 'used' because it is pressure washed, sanded, and re-toasted. Because of that it has characteristics of a scotch or aged tequila, and yet its profile remains distinct in that it is more fruity and floral than either. As with scotch, the nose is saturated with vanilla and hints of toffee, and the dominating flavor we tasted was banana bread. Our tasting was held at Chantanee in Bellevue, and therefore we had the mixology skills of Evan Martin at our disposal. What lucky girls we were! He served up 3 delicious cocktails for our meeting: the Negroni Doce (a twist on a classic Negoni), Brazilian Grog (a twist on a rum punch), and a Quentao (perfect for the holidays!). Stir all ingredients over ice, strain into coupe glass. Garnish with grapefruit zest. Shake briefly, strain over crushed ice in old fashioned glass. Garnish with an orange slice. Stir together gently. Serve in glassware that won't burn your fingers! Cheers! Or as they say in Brazil, Saude! 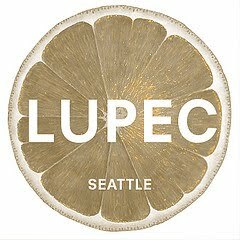 Thanks again to Jackie for letting me republish this and thanks to all of you for supporting LUPEC Seattle. If you have a favorite meeting memory over the last year feel free to post it in the comments section. Additionally if there is a place or a subject you’d like to see in 2011 put that in there too. I see that I never commented on November's outing, apologies! 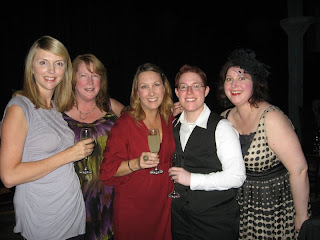 Us ladies went out on the town and attended "Sauced" a "cocktail theater" show of sorts. Chef Nordo teamed with Murray Stenson of Zig Zag to provide interesting cocktails and nibbles during this tale of love, intrigue and libations. The first drink served was called The Slippage. Blanquette de Limoux sparkling wine and St. Germaine. Next up came The Secret Kiss AKA The Alaska: Yellow Chartreuse and Pacifique Distillery Gin from Woodinville. 3rd in line was A Box of Nails AKA The Crumb Bum: Evan Williams Bourbon, Triple Sec and dashes of Angostura. Stirred, never shaken. For dessert there was a sweet chocolaty concoction called Nordo's Ephemera. It was a fun evening and a chance to see a little theater which held our beloved booze in the spotlight! Vesper, because it sounds like either a fast Italian sports car or the name of a stripper. Plus, it was my gateway drink to Gin and it's delicious. Further proof that Lillet makes everything taste amazing. Web Producer to pay the bills; Food Writer to subsidize my passion for cooking and eating. I just started writing reviews of cookbooks and cocktail books for the Seattle Weekly online at http://blogs.seattleweekly.com/voracious/cooking_the_books/. Rum and Coke: "Teaching teens to drink for decades." The worst cocktails I've had are the ones I've made myself at home. I'm not great at improvisational cocktail making. For me, it's like baking - all about precision. Maybe someday I can riff a great cocktail...but I have many more years of training. It'll be hard work, I know. Anything in a souvenir glass. For me, the best drinking partners are ones that are hilarious, energetic and chatty. For those reasons, Amy Sedaris would be my drinking partner of choice. Plus, she's a great writer, baker and craftaholic. She has a book called "I Like You: Hospitality Under the Influence." That's my kind of gal! Cooking, baking and snowboarding. I'm obsessed with my three cats - and all animals to be honest. My husband and I are in the process of remodeling our Mid-Century Modern home, so MCM design and anything DIY. Also travel, beer and wine. Especially wine tasting while traveling, while drinking beer. I have a food blog at satisfythecraving.com where I generally write about it all. Twitter - where I seem to hear about all great things these days. Manhattan. Anything with Bourbon really. Or just Bourbon, neat. We visited the Jimgerman Bar in Waitsburg (near Walla Walla) and can't stop talking about it. We had some great cocktails. Jim uses lots of fresh juices and herbs in his drinks. He made a Gin convert out of my husband which I had not yet been able to do (see question #4). Plus Waitsburg is an adorable town and is a great side trip from Walla Walla. Do be sure to check out Sonja's blogs if you haven't already. She is a great writer, dedicated drinker and a hell of a good time to be around! Thanks for being in our spotlight Ms. Vesper!